Nintendo obviously built Phantom Hourglass from the ground up with the DS in mind. A couple buttons equip items and open a map, but otherwise the stylus provides complete game control. The results are fantastic. I've never played a handheld action game that had such enjoyable, fluid and intuitive controls. They're as accurate as those of any console Zelda game, even in fast-paced combat scenes. In many cases they're even more precise. Landing bombs, arrows, boomerangs and sword slashes has never been easier. 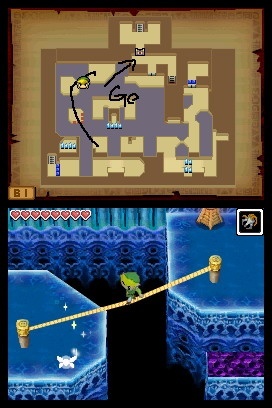 Phantom Hourglass also includes a cool feature that allows the player to draw notations directly on game maps. The story makes constant use of the system for treasure hunting, puzzle solving, note taking and more. Sea navigation also uses the touch screen. It's as simple as plotting a line across a sea chart, then manning the steamship's deck cannon as it putters off across the ocean. Most of Phantom Hourglass' puzzles, boss battles and the like are right out of Nintendo's Zelda playbook. I won't condemn the constant recycling of Zelda traditions, though, in part because they're characteristically well-implemented here, and in part because only a handful of other franchises (Metroid, for example) are inclined to tread the same paths. Most of the land- and sea-based combat is a walk in the park, and even the lengthier enemy battles are exercises in simple, repetitive strategy. Phantom Hourglass' puzzles are also easy, and most can be solved with a little exploration and the generous hints the game continuously drops. I can't help but conclude that Nintendo built it with the widest possible audience in mind, dialing down the difficulty in order not to intimidate. An understandable approach, to be sure, but one that will disappoint players looking for a more formidable challenge. Phantom Hourglass also makes use of the DS' Wi-Fi capabilities. It lets one player compete as Link, running through a maze to recover and deliver magic Force Gems while avoiding three lumbering enemies controlled by an opponent. 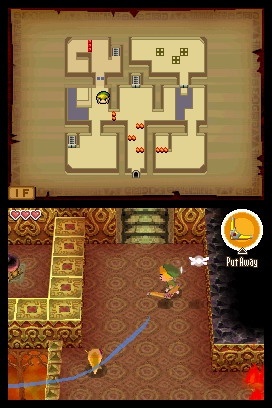 Link's enemies patrol the maze based upon lines plotted on the screen by the other player. Both players are aided by power-ups, and they switch roles between rounds. There's not much to it, but it's still enjoyable. Phantom Hourglass may be easy, simple and familiar in many respects, but it's still a weighty, engaging, masterfully made game. And it's a ton of fun. If you own a DS and don't own Phantom Hourglass, it's a problem you seriously need to fix - killer apps don't come about very often. As a writer and editor for Gamers With Jobs, Adam LaMosca has at long last achieved complete self-actualization. He also maintains a personal website, Lowspec.com, just for fun.